Wearing the No. 19 jersey as Jimmy Regan once did, in the annual matchup against Manhasset dedicated to the former Flyer, Ryan Lukacovic smiled at Chaminade assistant coach James Regan after scoring the game’s first goal. Jimmy Regan was a Manhasset native and All-American lacrosse player for Chaminade. He graduated in 1998 and led Duke to two ACC championships. He died in Iraq during his fourth tour of duty as an U.S. Army Ranger in February 2007. Regan’s father, James Sr., established the “Lead the Way” fund to honor his son’s memory and Chaminade and Manhasset have played a game for the past six years that also acts as a fundraiser for the foundation. Led by Lukacovic’s hat trick, Chaminade defeated host Manhasset Saturday, 10-3, in the non-league contest and evened up the annual series known as “Reg’s Rock,” at three games apiece. Longtime Chaminade coach Jack Moran said the senior attack’s character, work ethic and service to the school epitomized what Jimmy Regan stood for and therefore made it an easy choice to bestow the No. 19 upon him before the season. Matt Graham wore the number last year before graduating. Chaminade led 5-1 at halftime, playing fast, but also playing smart. John McDaid scored two goals, and Jonathan Patterson and John Tigh each had one in addition to Lukacovic’s three. Lukacovic scored three minutes into the second half. He notched his third a few minutes later after coming from behind the net to put Chaminade ahead 7-1 and put the game away. McDaid finished with three goals and Tigh had two for the Flyers. 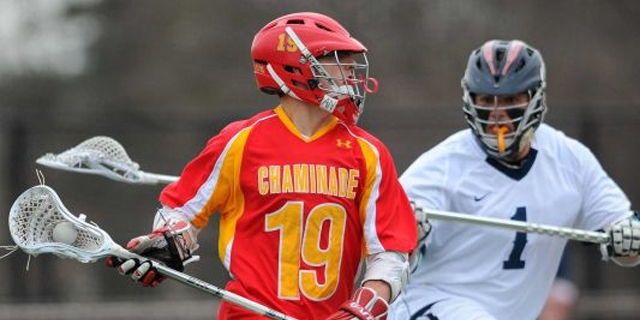 Kris Clarke won 13 of 17 faceoffs and Chaminade rarely turned the ball over, racking up possessions and maximizing the clock. Duke-bound goalie Danny Fowler didn’t receive much action as a result, but relished playing a game in honor of a hero who had ties to Fowler’s present and future schools. “I was told Jimmy was a guy who made you want to be the best you can be and it just drives you to want to play your best for a game like this,” Fowler said. Wearing cleats displaying an American flag design in honor of Regan, Tim Muller diligently defended Chaminade territory, holding Manhasset’s top scorer, Mike Fahey, without a goal. Before the game, coach Regan said his son’s memory would be served well regardless of the outcome. “I know Jimmy was looking down smiling at this game,” Regan said.